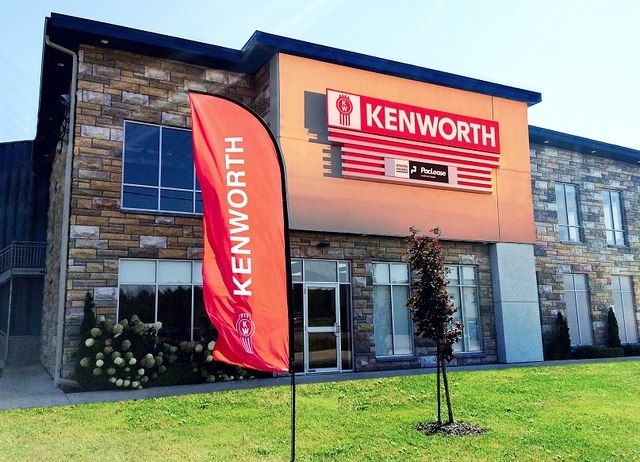 January 15, 2016 – Kenworth Montreal recently expanded its customer support by opening a new parts and service facility in Lanoraie, Que., located about 70 kilometres northeast of Montreal. The 14,600-square-foot facility is in an industrial and manufacturing area and is just southwest of Exit 130 on TransCanada Highway 40 for convenient access, said Mike Parent, general manager of Kenworth Montreal. Kenworth Lanoraie has a 5,700-square-foot parts warehouse capable of storing a large inventory for delivery throughout the Lanoraie area. The location offers six service bays, equipped with a fluid recovery and recycling system. Kenworth Lanoraie is located at 120 rue du Parc Industriel. The phone number is 450-887-1120. Christian Boucher manages the service department and Natalie Provost is the parts manager. Parts and service are available from 7 a.m. to 9 p.m. Monday through Friday and 8 a.m. to noon on Saturday. The service department offers full warranty support for PACCAR MX engine. Kenworth Montreal, which is located in Saint-Laurent, Que., also operates Kenworth Saint-Jerome.